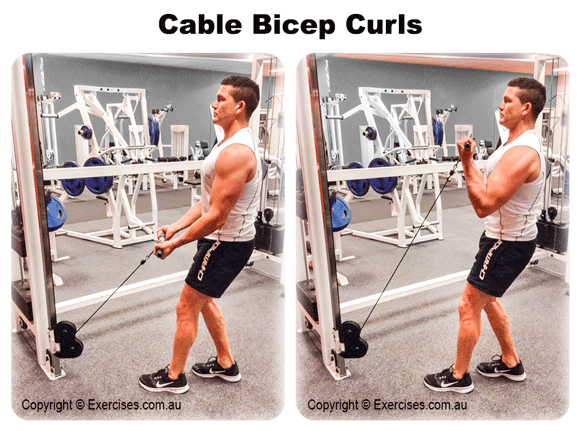 Cable bicep curl is a great alternative to the traditional barbell curl to build the biceps. It has an added benefit of placing constant tension on the biceps throughout the entire range of motion. It’s also a great exercise for those who may not have access to a barbell or free weights. Locate a cable station and attach a straight bar to a low pulley attachment. Grasp the bar with an underhand supinated grip. Stand approximately 2 feet back or until there is sufficient tension felt on biceps. Keeping elbows pinned to the sides and perpendicular to the ground, curl the weight up and squeeze. Slowly lower the weight back to starting position and repeat. Keep elbows pinned to the torso at all times to avoid swinging the weight up and using momentum to carry you through the exercise. How Often Should You Start A New Workout Program?